There have been some big changes lately in the Arrowverse having to do with the ‘Big Bads” of each show. Today I’m going to do a quick pass over each to see where we are at, their motivation, their plan, and how all that is working out. Let’s speed on over to The Flash, where the changes have been body / actor related. 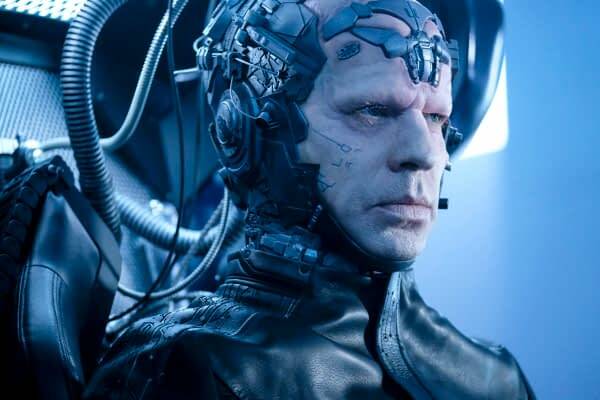 Pictured: Neil Sandilands as The Thinker — Photo: Robert Falconer/The CW — © 2017 The CW Network, LLC. All rights reserved. Clifford DeVoe (Neil Sandilands) is brilliant. Like, Wiley E. Coyote Super-Genius level — and he has an idea of how to get smarter. His plan involves a cap that, with the help of his wife Marlize (Kim Engelbrecht), will help him become even smarter. He has it figured out that the particle accelerator being built by Harrison Wells (Tom Cavanagh) will explode and he could use the energy wave to power his cap. This has both positive and negative results. He does become smarter — to the point that he can predict the probability of every scenario so exactly that it’s almost like he can tell the future. The downside is it has created a degenerative disease in his body that has crippled him and will kill him shortly. I think the simplest way to explain DeVoe’s motivation is that he wants to live. Or at least that seems to be part of his plan. He wants to find a new body that he can transfer his consciousness into and be able to be with his wife again. That is understandable in a lot of ways. But his plan is much bigger than that, and he has no qualms about hurting people in the process. He seems determined to ruin Barry Allen (Grant Gustin), but they had no previous interaction that Barry can remember. And we have yet to see what his master plan is, so it’s hard to say if he really needed to mess with Barry as much as he has or if he really needed to expose twelve different people to Dark Matter. DeVoe is all about machinations, really. He planned a way to force Team Flash to bring Barry out of the Speed Force, meaning he knew Barry was in the Speed Force and that the Speed Force even existed. He manipulated it so Barry would return at a certain place and placed certain people right in their path. And it seems he controlled getting Dominic Lanse (Kendrick Sampson) the powers to make the consciousness transfer possible. He obviously has a much bigger plan going as well, but what will it be? Did DeVoe choose the other people on the bus knowing which powers they were going to get? Does his overall plan include taking the powers from all of the others and using them himself? And why change bodies again into Becky Sharpe’s? Which means DeVoe has been played by Sandilands, Sampson and now Sugar Lyn Beard. And why has he left Ralph Dinby (Hartley Sawyer) alone so far? Did he only need some of the bus metas while the other were just collateral damage? Will he eventually need Fallout? And what did he end up doing with Weeper (Matt Afonso) as we saw DeVoe use Weeper’s tears to control Marlize last week? The Thinker has been a very interesting and different villain for the Flash this season. But the change in power of the big bad hasn’t change the result. For three seasons it’s been Flash versus another speedster, and Barry wasn’t fast enough and had to be faster. This season the villain is smart, and Team Flash is smart enough… but they have to get smarter. Barry, a scientist in his own right, has had his intellect downplayed in the series by those around him. I liked season Barry bust himself out of prison and hope to see him start to outsmart the Thinker soon. The Flash returns February 27th at 8 p.m. ET on the CW.